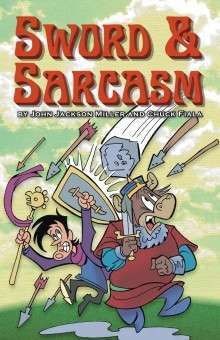 The complete Sword & Sarcasm series — more than 160 full-color pages! Herbert is a mercenary with heart — and a curse, forcing him to serve the most annoying person in the world, Duke Benedict! Follow their hilarious misadventures as they meet conniving aristocrats, calculating werewolves, and the slinky cat-girl sorceress, Casmerelda! This edition collects the complete series from writer John Jackson Miller (author of the Star Wars: Knight Errant comics and novel) and Looney Tunes artist Chuck Fiala. The file also includes a full-color map of the Sword and Sarcasm world! This title was added to our catalog on April 25, 2011.